The Assassin's Creed franchise has come a long way since its debut in 2007. Scaling the walls (now even scaling trees!) 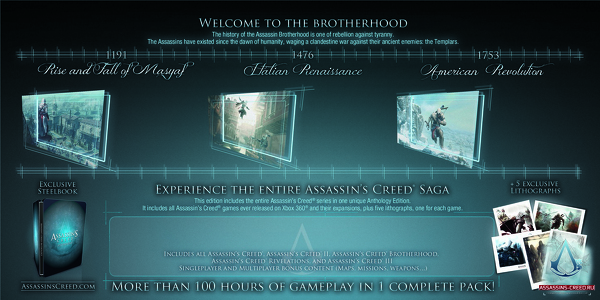 and drop assassinating have never felt so exciting before, just to name one of my favourite features. To make the whole set complete, Ubisoft has also thrown in all the DLCs from before. This, presumably also, will include a season pass for the recently-released Assassin's Creed 3 as its DLCs are only set for next year. Prices, release dates and official launch platforms have yet to be announced but we'll be updating any news here. Meanwhile, are you excited about this, a prospect of what we would like to call, a 5-in-1 Assassin's Creed combo?